There are many advantages to having trees on your property. They not only look great, but they also provide fresh air and natural shade. Many people grow attached to their trees and start to develop a fondness for the ones they see every day. That’s why it is often hard to imagine needing to cut down a tree on your property. In many ways, the tree may feel like an old friend, and it can be sad to see it is time for it to go. But as trees age, they dry up on the inside and start to become weak and unstable. A strong wind or bad storm could cause the tree to fall down and damage your home or property. The damage from a very large tree such as an oak or pine, could be incredibly hazardous and potentially very expensive. Many times the only solution to such a problem is to have the tree cut down. But this isn’t a job you should handle on your own or trust to someone who does not have professional experience. Trees, and especially the larger ones, can be dangerous to fell and can cause great damage if they fall the wrong way. You could end up with a tree laying on your house or vehicle if you’re not careful. If you want reliable results that won’t endanger your family or your possession, you need to make use of professional tree lopping services like those offered by Jim’s Trees. 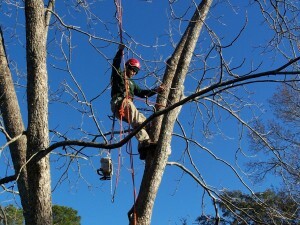 We have been helping our customers deal with their tree problems safely and effectively for years. And we are proud to bring our expertise and friendly service to you and your family. While it may be difficult to part with an old tree you have grown accustomed to seeing, it may be best for the safety of you and those around you. Contact us today to schedule a consultation with a friendly tree expert. Or just use the form on this website to get a fast, free quote right away. We are sure you’ll be pleased with the professional tree lopping services we provide.